Looking for protection from a potential sump failure and a flooded basement this Mississauga, ON homeowner, contacted us. They wanted their basement to be kept dry all the time with no more worries about it in the future. We installed our TripleSafe™ Complete Sump Pump System with three levels of protection for the basement. An animal had dug out a hole under this front step causing it to settle. Billy, Installation Foreman, used PolyLevel® Injection to lift and stabilize the step while filling in the voids created by the animal. He then used our NexusPro® Joint Sealant to seal the gap between the patio and the stoop to prevent any other water damage. Water leaking into basement. Isolated location, but looks to be coming from an outside wall. Drywall is wet, and water is pooling underneath laminate floor. Water coming in the basement from under a installed floor. Not sure of the source. Hello, when is the best time of year to complete a crawl space vapor barrier installation? And what is the approximate cost? Top quality and professional . Fitz did a great job, under extenuating circumstances. There was some confusion about exactly what I ordered to be done, but it all worked out. After a second flood we hope this system will do all you say it will. Keeping our fingers crossed that this last expense will remedy the problem. "Amazing, very considerate, polite, efficient and took the..."
"Fitz Wilks serviced our sump pump and backup battery last..."
This TrenchDrain prevents additional water from entering the basement from the outside. Mississauga lies on the shores of Lake Ontario in the Southern Ontario. Home to around 714,00 residents, Mississauga is the sixth-largest city in Canada – and these homeowners need access to a proven basement waterproofing company to solve their wet basement problems. Clarke Basement Systems has been serving Mississauga ever since we opened our doors in 2003, and we're the company to call if your basement is in trouble! A wet basement or crawl space can lead to numerous hazards for your home. Mould or rot can grow and cause poor indoor air quality and structural damage, while dampness humidity is also uncomfortable. Your basement will quickly become unusable, and you'll have to remove stored items or laundry appliances. This will also most likely decrease the value of your home overall. Rather than having to deal with a bigger mess in the long run, let Clarke Basement Systems install a complete basement waterproofing system that will protect your home! We offer a variety of sump pumps, drainage lines, dehumidifiers, and additional products to make your basement a drier, cleaner space. We also specialize in crawl space encapsulation, which uses unique crawl space products – including an extremely popular moisture barrier – to prevent moisture and water vapor from entering the space. Get the most from your below-the-home spaces by working with Clarke Basement Systems for your waterproofing needs. Our fully trained and certified specialists are authorized by Basement Systems, Inc. to use their proven, warrantied products in your home. Schedule a free estimate in Mississauga today! Foundation or slab heave is one of the many foundation problems your home may be experiencing. Clarke Basement Systems is also a foundation repair specialist able to restore stability to your home. The soils around your home are crucial to bearing the weight of your foundation and the rest of your home. But a variety of factors can create difficulties in this process and will eventually damage your foundation. Have you noticed any of these symptoms around your home? Clarke Basement Systems's foundation experts will be able to pinpoint the cause of your foundation troubles by inspecting these symptoms and the conditions of your property. Once we know what the problem is, we'll be able to recommend the best course of action using our Foundation Supportworks proven products. From foundation piers to wall braces, we have the technology to restore your foundation; and all of these products come with a written warranty for your peace of mind! In the event of sinking or cracked concrete slabs on your property, Clarke Basement Systems can use PolyLevel concrete leveling, NexusPro cracked concrete repair, and SealantPro concrete sealing for an efficient, effective repair. Unlike traditional mudjacking techniques, PolyLevel uses a lightweight, expanding foam that is injected beneath the slab. This quickly raises the slab back to a level position. PolyLevel is a minimally disruptive, environmentally friendly alternative to other techniques and Clarke Basement Systems is proud to offer it! NexusPro is a quick-drying, ultra-durable solution for repairing cracked concrete and joints. It is resistant against UV rays, extreme weather patterns, fluctuating temperatures, and more to assure your cracked concrete repair lasts and lasts. Whether your concrete was just repaired, you have existing slabs, or newly installed slabs, SealantPro can extend its life by 3 to 5 times overall in just one application. This powerful concrete sealant guards against oil, gasoline, liquids, and debris to assure both your concrete and your home's image is secure for a lifetime. We've seen all kinds of concrete, foundation, and basement issues in the past, and your home should not be any more difficult than the problems we've fixed before. We offer free estimates for all of our services in and around Mississauga - schedule yours today! Flexispan was installed on the large crack to permanently fix the problem. This small crawlspace had a large crack in the foundation. Flexispan provides drainage strategy allowing water to drain to the sub-flooring. Our customer in Mississauga, Ontario, had an issue with the front step of their home that had been sinking for a few years. Recently our customer had noticed that an animal had dug out a large hole underneath the concrete which further weakened the substrate, creating an area where water could wash out any loose soils. Our Polyurethane foam is injected beneath the concrete to lift and level the slabs. The foam compresses the substrate and then lifts the concrete, thus ensuring that the area is protected from further settlement. Billy used our NexusPro™ Joint Sealant as a caulking to seal any cracks and gaps in the concrete to prevent water from penetrating the substrate. Our customer was pleased that our team was able to lift the step back up to its original height and were able to stabilize the rest of the walkway to protect the area from further settlement. Walter of Mississauga, Ontario had an uneven driveway located at the entrance of his garage. The cement had cracked and had become a tripping hazard for the customer. The customer also had further concerns that water would leak into the cracks and freeze causing further damage to the driveway. Due to the unevenness of the driveway, the customer had a struggle getting into the garage with his vehicle due to the change in the height. After a full review of the problem, Bill and Kyle were able to inject a structural grade polymer into the cement to fill the voids which allowed the concrete to lift and stabilize. The nexus pro sealant was used to seal and fracture cracks that may cause further damage to the driveway. Walter was very pleased with the work done. With having the garage at a safe height, he can now enter the garage with a vehicle. The driveway has an overall more appealing look, without the worry of being a tripping hazard. A home in Mississauga, Ontario had several wall cracks located in the basement and crawlspace. The wall cracks were leaking causing damage to some wall material in the finished area of the basement and there was water on the floor of the crawlspace which could damage stored items. The homeowner didn't want the problems to worsen and wanted to finish parts of the basement. The customer called Clarke Basement Systems and spoke to Ron Monk who explained everything that would be done to the impacted areas. Mark Dougherty and the team came in and installed Flexispan Wall Crack Repair System and Drainage systems. Flexispan seals the crack with a polyurethane sealant then provides a secondary drainage strategy to ensure the wall crack never leaks again. No amount of wall movement will cause the crack to leak again. The crack is sealed first with a flexible polyurethane sealant. A secondary drainage membrane is installed over the first layer and then a third layer of the polyurethane sealant is applied. The floor is opened up below the crack and cactus board is installed on the footing. When the floor is restored, the cactus board allows for a gap between the floor and wall and footing and floor. This drainage strategy ensures that if the crack ever leaked through the first polyurethane seal it would be drained to the sub-floor by the secondary drainage membrane. The customer was satisfied because the cracks were permanently repaired with a 25 year warranty against leakage. The warranty is nationally backed through the Basement Systems Dealer Network and is transferable should they decide to sell the home. When Brendon & Anne C. discovered significant water intrusion into their basement, they knew they needed to act before they suffered property damage. While trying to find a contractor up to the challenge, they found Clarke Basement Systems. Don Clarke met with the couple to diagnose the severity of the situation, and after close inspection he recommended the WaterGuard Perimeter Drainage System, ThermalDry Wall Waterproofing, SuperSump sump pump system, and finally IceGuard to prevent drain lines from freezing. Primary Foreman Jose Martinez oversaw the installation, ensuring a long-lasting solution to Brendon and Anne’s leaky basement. The couple was very happy with the results and would recommend Clarke Basement Systems to others. I have basement wall leak: Window well; Mold joint holes; Top of foundation walls. We have a crack in our basement wall that the previous owners tried to fix. After rain last week, we noticed that some water was getting in. We need to get the crack fixed - waterproof injection? My basement seems leaking right now, and i want to fix it. My sump pump was running but not pumping water out 2 days ago. Now it is not running at all. "Pump status" is flashing slowly on backup system and alarm is ringing. Home is 3 years old. Not sure if a repair or replacement is needed. Water leak in the basement. I observed a water leakage from a specific point in the basement foundation of my house this summer after during the heavy rainfall. The house is 10 years old and the basement is unfinished. 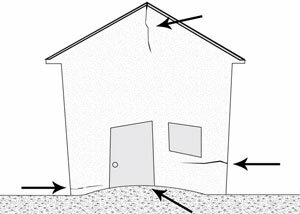 A small crack in the foundation can be seen easily. Rest of the basement foundation is absolutely fine. How much it will cost for an injection repair or whatever is required? My porch concrete slab with the time has sunk about 4-5 Inches and 1 inch more towards a corner. I'd like to bring it back to level.